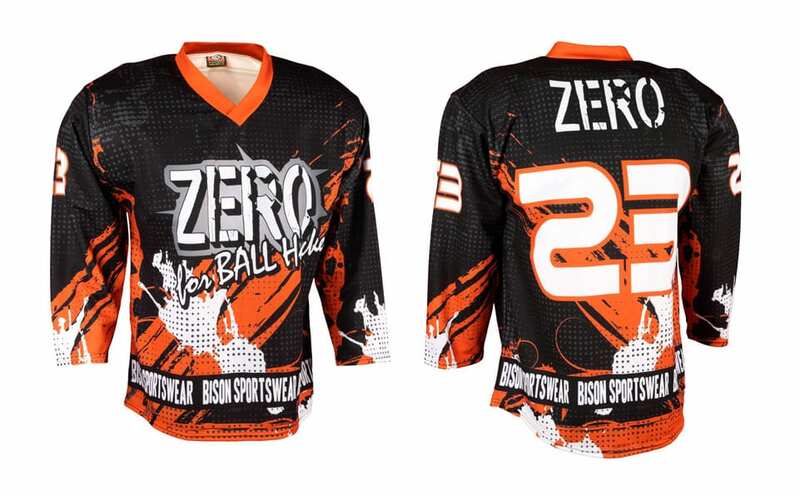 Ball hockey jerseys, socks, shorts and team wear | Bison Sportswear. Street hockey has much to do with ice hockey, with the main difference being that players do not have ice-skates on their feet but shoes and do not play with a puck but with an orange ball. It is physically very demanding sport and represents a great deal of strain on players and their gear. 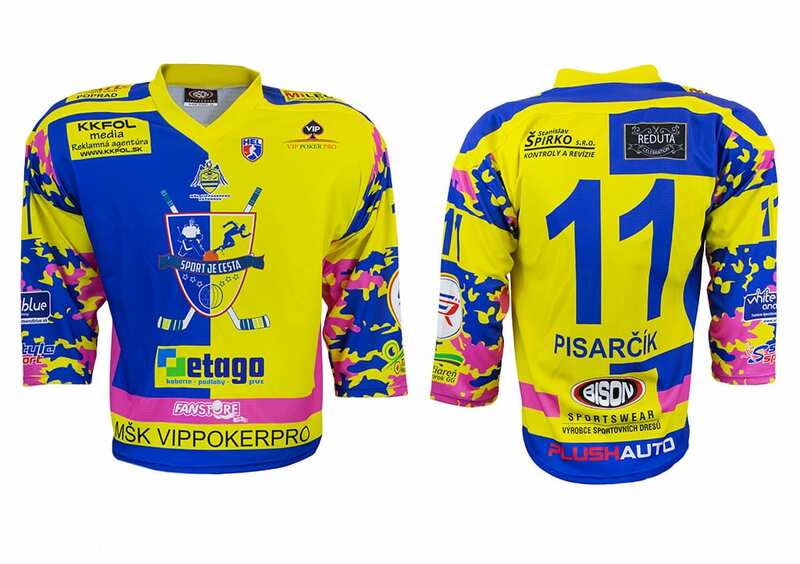 We offer you street hockey jerseys specially tailored to this demanding sport. 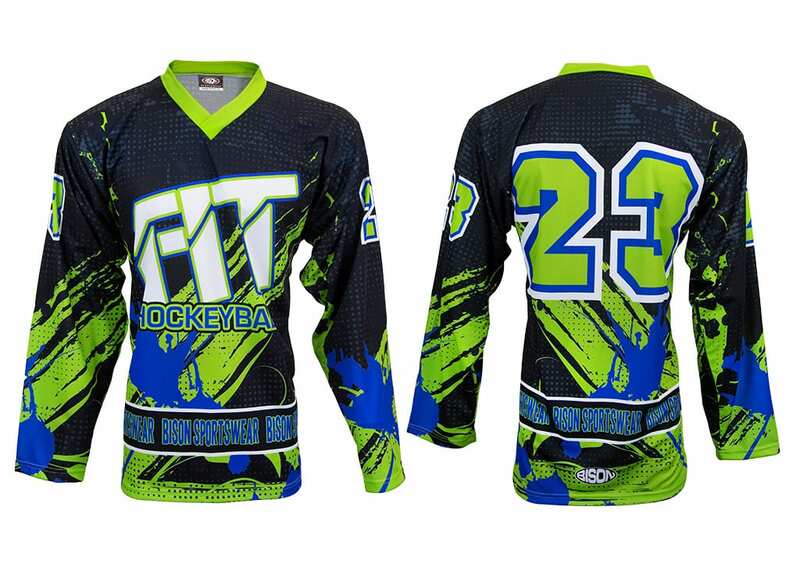 Jersey for street hockey is made in several patterns, namely Classic, Round Yoke, Rectangular Yoke, Raglan, Raglan – Round Yoke. All patterns can be further adjusted. It is possible to carry out the adjustment in the form of double sleeves or shoulders, sewing ventilation and mini-ventilation mesh into the side part of the jersey and the like. We adjust color of the meshes as one of the few manufacturers in order to achieve perfect resulting jersey design. Naturally, you can choose the type of collar, fonts and numbers according to your wishes. We also have an option to choose lower finish of the jersey in the STANDARD or PRO style. The basic size jerseys can be determined using the size tables. The best materials of jerseys are: CANADA 230 gr., Sun 230 gr., Elite 230 gr. and ZERO 215 gr. Canada 230 gr. is the most widely used, professional and high quality knitwear ensuring the high quality and durability. Sun 230 gr. is a high-quality polyester knitwear, which is now very sought-after item for its smooth texture, which makes all the logos and designs stand out. Elite 230gr. 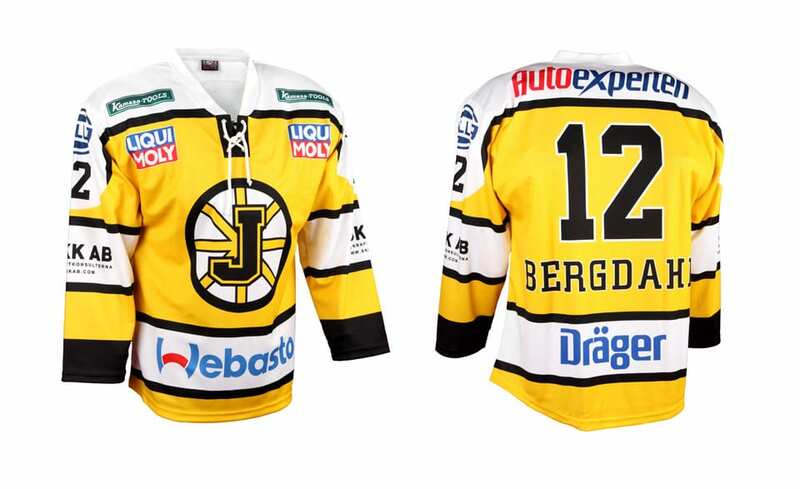 is polyester material that is specifically designed to the materials used in the NHL. It creates the impression of a cube design to highlight the effect of the highest quality of the jersey. ZERO 215 gr. is a novelty. 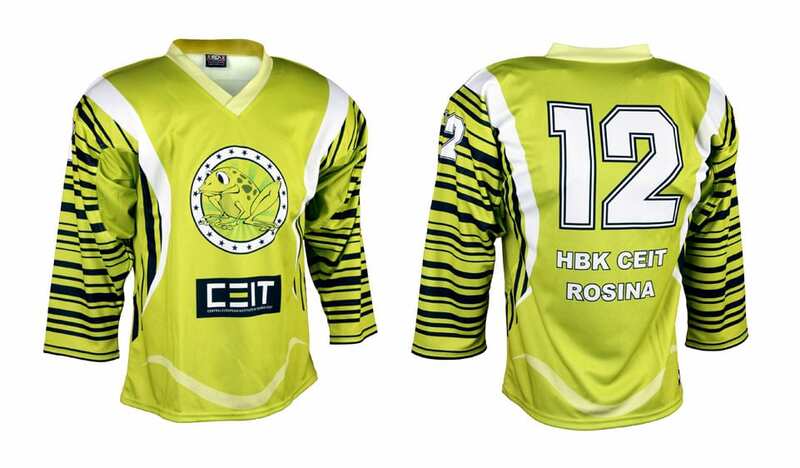 It is a polyester material particularly selected for street hockey. More detailed information about materials can be found here. Information on the price can be found in the price list. We produce sublime street hockey socks from a strong polyester knitwear Filet 350 gr. This material is highly elastic and perfectly surrounds your body. While maintaining all the requirements for the necessary functionality, we offer the possibility of own, original design on street hockey underwear. You can have them in any club colors, with a logo of the club, the sponsors or with the name for each player. We will prepare for you custom-designed underwear in our graphic studio for free! Street hockey shorts and shorts can also be chosen and ordered separately without the jerseys. However, if you need a complete sporting set, we recommend choosing a jersey to which we will prepare a correction of the shorts in the same design without any commitment. Street hockey shorts are manufactured in two versions of the pattern. Men’s (classic) and women’s (elastic). You can choose from new, attractive adjusted patterns. The best materials of jerseys are: CANADA 155 gr., GIRO 160 gr., LION 160 gr., KOSTKA 145 gr., BÁRA 145 gr. and GOLF 205 gr. More detailed information about materials can be found here. If you do not choose any jersey model from our offer, or you require the jerseys in the original design, we can together create jerseys according to your ideas in our graphic studio. Individual production always takes place after approval of samples or print previews. In the event of loss or destruction of your current jerseys, we would like to complete incomplete sets by making similar jerseys so you can continue using these jerseys. The size can be determined using our size tables. And the price? Basic information can be found in price list. Bison has prepared jerseys for streets hockey referees for you. We will be glad to supply you with Profi and Standard jerseys. This is a very popular jersey, because of the material specifically designed for jerseys of referees (100% polyester Drom, 280gr. ), is not creasing and retains its shape. The jersey is washable without loss of the colors. Silk black collar with a long zipper makes it easy to put on and take off the jersey. According to the order, we supply Assistant and Main Referee (imprinted orange tapes) jerseys. Profi category jerseys has an inner sleeve part completed with black mesh for perfect air circulation.